Electroplated diamond and Cubic Boron Nitride (CBN) tools are made up of a basic single layer or multi-layers (depending on application) that are bonded to the tool surface using a nickel matrix. The product can be made with various shapes and they are suitable for special complicated profile, surface grinding ,Internal grinding, Slot grinding,Profile grinding and others form grinding. The electroplated grinding wheels have characteristics of high grain density ,sharp grinding ,high efficiency, good precision ,without dressing etc. The product can be made with various shapes and they other form grinding which have strict requirement on geometry and a lot of tools which are difficult to process with other methods can be solved here .are suitable for special complicated profile , super-thin ,especially small and other form grinding which have strict requirement on geometry shape and dimension ,Therefore it improves the process efficiency and a lot of tools which are difficult to process with other methods can be solved here . Electroplated CBN products :Mainly used for machining metallic material such as chilled cast iron ,founded alloy steel ,titanium alloy and so on . free-faster cutting, no dressing, less heating due to the diamond particles protruding from the surface. 1)Type:resin bond diamond/cbn grinding wheel,electroplated bond diamond/cbn grinding wheel,metal bond diamond/cbn grinding wheel,vitrified bond diamond/cbn grinding wheel. 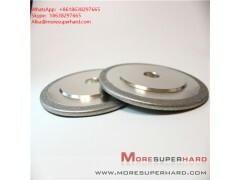 2)Shapes:cup diamond/cbn grinding wheel,flat/plain diamond/cbn grinding wheel,taper cup diamond/cbn grinding wheel,dish diamond/cbn grinding wheel etc.